2 X 10 Stamped Steel Floor Register - White Discounts Apply ! Steel vent covers feature sturdy all metal construction including the damper. 2 x 10 Floor registers have a quality baked on powder coat finish. The steel vent cover extends wider than the damper to ensure a good fit once installed. 2 x 10 floor register has an adjustable steel damper that easily opens or closes. Steel vent covers have a clean contemporary look. 2 x 10 floor registers are quality made and offered for a great price. These steel vent covers are simple to install making them ideal for anyone to use. ***Hint: Order steel vent covers using the actual hole opening size and not the faceplate size. 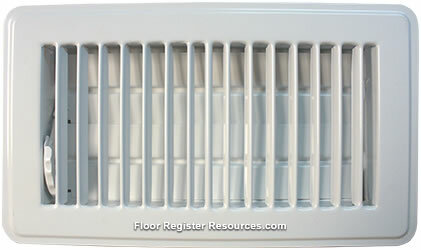 This classic white floor register will fit a 2.25 x 10 inch hole opening. Steel vent covers are available in many sizes and also brown. These 2 x 10 floor registers are quality for a fair price. Update the look of your home today!